Face the Art Entertainment - Bubbleology | Face Painting | Photobooth | Clowns | Henna | Entertainers | Balloonists | Theme Parties | Party Rentals | Candy Art | Inflatables | More! Our show has been featured on Breakfast Television, YTV, Treehouse TV, CBC Kids, TVO Kids, Rogers TV, CHCH TV and many national newspapers and magazines. We have performed at large events all over Ontario, Quebec and even Florida! We have performed at large venues, stage shows, street festivals, schools, museums, theatres... even in backyards and living rooms! This show can be tailored and performed anywhere for any number of people. For over 7 years we have mastered the art, magic, science and wonder of bubbles. Our shows are educational, interactive and entertaining! 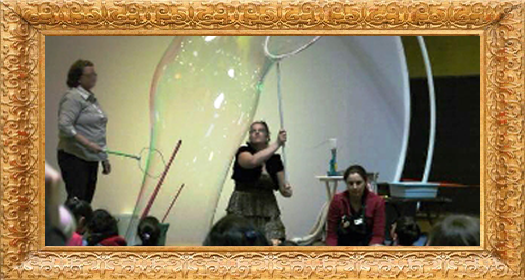 Let us invite you into the science and delight of soap bubbles, fascinating for children and adults of all ages. Our "Bubbleologists" can tailor a program to fit YOUR needs, always adding in charisma and pizzazz to your show, with innocent comedy & wittiness, visual art and amazing bubble manipulations - from intricate to mega huge and detailed Bubble Art this is a curiously delightful experience and great adventure for any age! For outdoor shows we transport you into the magical world of mega bubbles, millions of bubbles and ameba shaped bubbles floating high above. We can put a bubble over your guests, make millions of bubbles in one swipe of our magic tools, we make mega bubbles that are up to 50ft long and hundreds of mega bubbles all around you. Different from an indoor show; outdoor shows are about GIANT bubbles! You will be astounded at the sheer size and length of these bubbles. World record contending mega bubbles will make an appearance during Bubbleology’s Outdoor Shows. The show can be tailored as an all-inclusive educational program and brings together science, education, magic and fun for the perfect educational show. Specific topics can be interwoven as requested. The one and only original Bubbleology Show providing interactive programs for private parties, schools, preschools, daycares, libraries, museums, camps, festivals, church events, corporate events anywhere. This is where we bring the wonder of all the bubble shows into one great stage show of pure visual art. In this show we bring together two 'bubble sisters' on one stage simultaneously performing together. Double the fun, double the art, double the magic, double the visual stimulation in a bevy of beauty with awe inspiring dancing and dazzling bubbles that encompass the entire stage. In a perfectly choreographed musical beauty of bubbles with a great musical score all merged into an exquisite and elegant show for all. Our bubble shows have been used for print, media, TV, Background ambient art, fashion or any other types of media outlet where an eye extravaganza would be required. Having one of our Bubbleologists as a part of any high profile, art, media or fashion event is always a spectacular addition. We have performed for many TV shows, music videos, fashion shows, gala events, TV shows, concerts plus many more venues and events. Feel free to contact us in regards to how our Bubbleologists can add that exquisite touch to your events today, we are more than happy to modify our artistic performance to meet our clients needs. Indoor shows come with a 100% NO MESS guarantee! We bring our own floor coverings.